What does effective leadership look like, not just in theory but in action? Moving Leadership Standards Into Everyday Work: Descriptions of Practice enhances the usefulness of the California Professional Standards for Education Leaders (CPSEL) by illustrating key knowledge and actions reflected in leadership that supports all students to learn and thrive. The recently updated descriptions of practice (DOP), derived from consensus-building among experts and practitioners, show what individual elements within each of the six CPSEL look like across a continuum of practice. Each continuum, ranging from practice directed toward the standard to practice exemplifying the standard, provides common concepts, language, and examples for a given leadership element. Today’s school administrators must assume multiple roles, from catalyst to manager, from expert to facilitator. This resource, which includes a tri-fold version of the CPSEL, offers a realistic view of how those shifts translate into effective leadership. Download the recently updated California Professional Standards for Education Leaders (CPSEL). The Association of California School Administrators represents and supports a broad range of education administrators who know that “leadership matters.” We often use the descriptions of practice (DOP) from Moving Leadership Standards Into Everyday Work, along with the California Professional Standards for Educational Leaders, for planning our programs, training, and coaching network. The DOP are important to school and district administrators, leadership coaches, program sponsors, and other education partners with whom we work because they help all of us grow and support effective leaders. Moving Leadership Standards Into Everyday Work is an excellent guide to assist beginning — and experienced — administrators to reflect on best education leadership practices. The descriptions of practice serve as a map for them to benchmark their practice and reflect on next steps in the domains of education leadership to ensure all students have access to quality learning opportunities. This practical and research-based tool was written for and by educators, insuring its relevance to administrator candidates, practicing administrators, supervisors, policymakers, and students studying the qualities of education leadership. Moving Leadership Standards Into Everyday Work is designed to establish a standard of best practice for administrators serving in all K–12 settings. As a principal I use it to reflect on my own practice and to support the development of our assistant principals. The power of Moving Leadership Standards Into Everyday Work is that the descriptions of practice gives our practicing administrators a better understanding of what their work is and allows them to “see” themselves as they apply the leadership standards in their own practice. This has been an invaluable tool, used in the Clear Administrative Services Credential program, for self-assessment, to assist in identifying areas for coaching, and to focus ongoing support that moves developing leaders toward practice that exemplifies the standard. 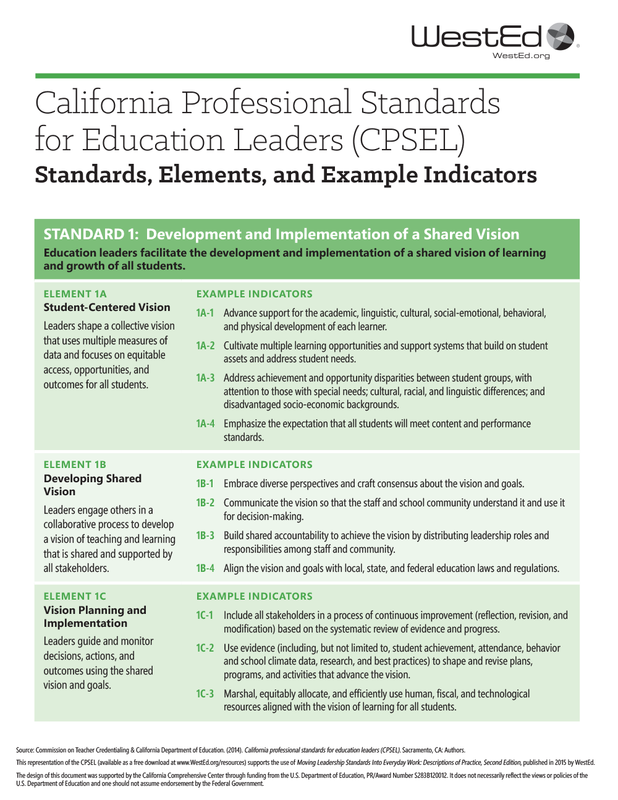 In the updated California Professional Standards for Educational Leaders, each standard is fleshed out with elements and example indicators intended to make the standard more accessible. 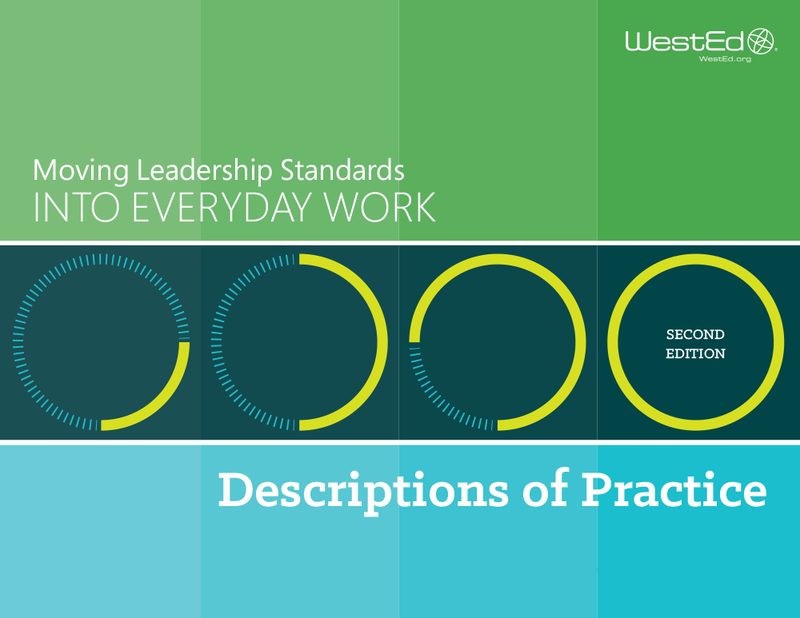 The second edition of Moving Leadership Standards Into Everyday Work: Descriptions of Practice — perhaps known best as the DOP — takes that effort a step further, illustrating for each element what practice looks like along a continuum of expertise. These descriptions of practice are an invaluable resource for anyone involved in an administrator training program, from candidates to coaches, from partnership employers to program developers. The contents of this planning and assessment tool help all of us better understand the qualities and expertise required of today’s education leaders. This brief demystifies the concept of collecting and using multiple forms of information in principal evaluation systems and provides examples of those who have done so successfully. 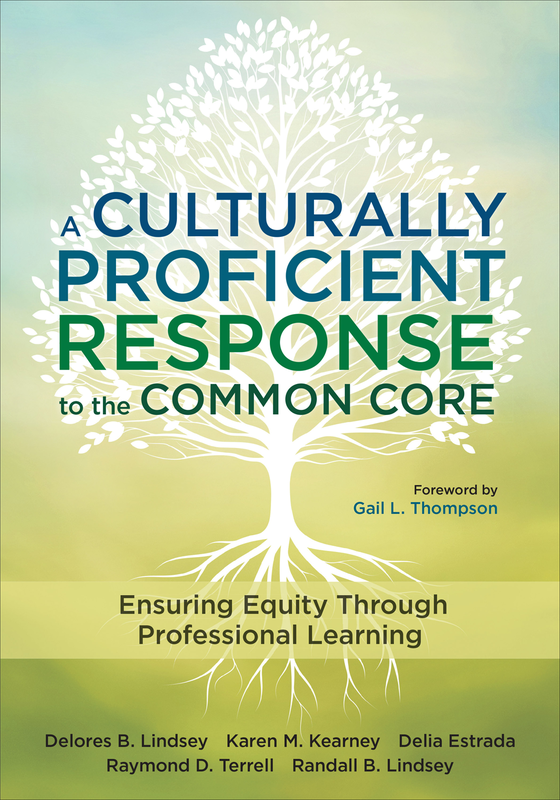 This new resource is designed to help educators lead a Common Core implementation that closes achievement gaps. This version of the California Professional Standards for Education Leaders is a quick reference most helpful when used with the updated Moving Leadership Standards Into Everyday Work: Descriptions of Practice.